Poll: What kinds of pick-ups would you like to see in Grip? What kind of additional weapons and power-ups would you like to see in Grip? Tazeram wrote: It doesn't really make much sense that EMP can cause the car to skid around and lose control. 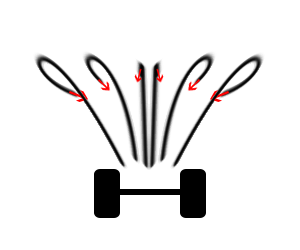 EMP shuts down electronics, it doesn't impact steering ability like you have ice on your wheels. Or it could do a little bit of all three... i don't know... i just liked the idea of voiding the weapon slots somewhat... i'm not really sure what best suits EMP. Guess testing variations out would be a good idea. Yeah it would take some testing, but i see no problem with having a weapon that temporarily shuts down steering and doesn't slow the car down, but doesn't allow it to accelerate. Plus there could be small forces caused by electrical shock that move the car around slightly. Doesn't need to be realistic! So you want the gun to sound like the biggest wet fart ever conceived? Ria wrote: I never got the point of the chain gun in Rollcage 2. A machine gun is a weapon implemented in games for causing small bits of damage that sum up to a large whole if directed with skill. But small bits of damage make no sense in Rollcage, where the cars are indestructible. So instead the impacts cause the car to slow down and lose handling, which doesn't really make intuitive sense (unlike a car being lifted clean off the ground when hit with an explosive missle) and is fairly frustrating to be on the receiving end of. Explosions = fun. Frustration =/= fun. I say scrap it altogether. There are only so many weapons you can implement that throw your car into the air. Why have anything other than a missile then? The current gun causes the opponents car to almost lose control. It's not a guaranteed thing like the rocket. If you catch someone taking a turn and light em up, you have a better chance of sending them off course. nakano wrote: - Snare. Sounds interesting, but how about shooting one side to the opponent car and then giving a change to shoot the other side somewhere else (like to wall), would make opponent car to go that direction. Might be difficult to implement, just an idea. - A harpoon is shot from the center of the car. - You try to hit a car in front of you. The other half of the harpoon and rope is attached to an opponent car if you hit it. * An other car, the opponent crashes into other vehicle. * Same car, no effect. - You have a few seconds to shoot other half before the harpoon automatically unattach. - If you accidentally hit an obstacle with the harpoon, better to shoot the other half before the harpoon effects on you. For example, if it gets stuck into the wall and you don't shoot the other half, you get a boost backwards when you pass the harpoon. 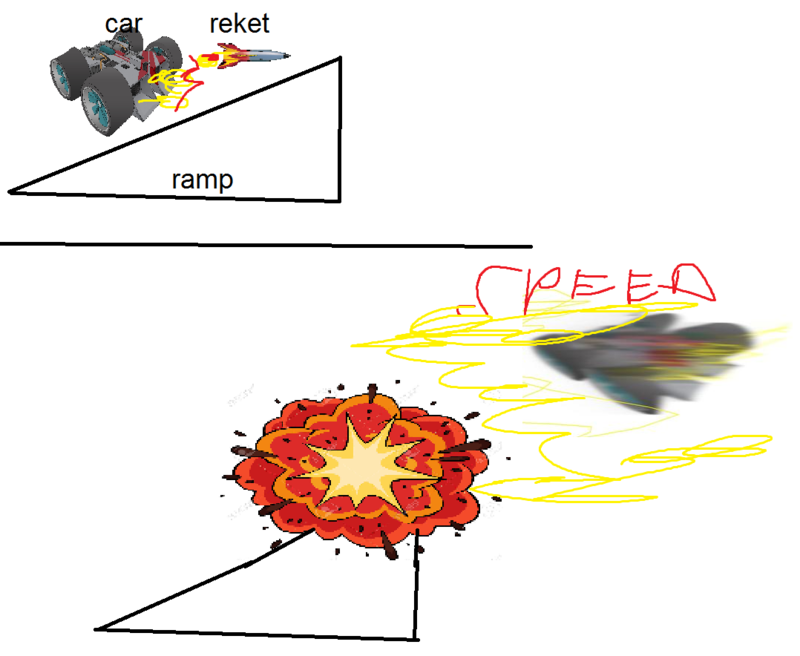 However, you technically can shoot the first half of harpoon to a wall and the second half to an opponent car. The order is up to you. For the orbital stike there should be a limited range though. I im not so sonvinced of the idea of an EMP as one of the key points about RC is that you're always in motion. Whether driving or being blasted! The snare seems to have the same concept as the worm hole. The plasma canon idea I'm unsure but could be tested. Why no love for the snare item? Sounds awesome. Imagine snaring somebody on the ceiling when you're on the floor and you pull them down or they pull you up! Jello_Snake wrote: Why no love for the snare item? Sounds awesome. Imagine snaring somebody on the ceiling when you're on the floor and you pull them down or they pull you up! Ha, all this sounds awesome but also incredibly difficult to get working properly. I think this could be a DLC type power-up if anything. Something like this could cut pretty deep into development time and testing for balancing issues. Like I said though, awesome. SMOKE SCREEN - an offensive weapon designed to confuse racers behind you. When you activate a Smoke Screen, a thick plume of smoke emanates from the rear of your vehicle, blinding racers who pass through it (user's hud & screen is hidden behind the grey clouds of smoke). The smoke remains on the track for several seconds. TIP: Ideal combination is activating a Smoke Screen and then place Mine. Upgraded version: Shock Screen which causes the same plus light electro shock to the engine. OIL SLICK - Oil Slicks are weapons designed to hamper your opponent’s handling ability. When used, oil spews from the rear of your vehicle, creating a slippery streak on the ground behind you. Vehicles that drive over the oil lose traction and skid out of control, often into walls or other objects. TIP: place Oil sclick in turns. Upgraded version: Fire Oil Slick which causes the same plus medium to high damage (depends on how long the vehicle stays in fire). SAUCER DRONE - Saucer Drones are offensive weapons with pretty decent stealth design. When the standard version of this weapon is launched, a saucer-shaped drone pops out from the rear of your vehicle. The drone then blindly races against trafﬁc (half the speed of vehicles), following the ideal race line for the course. Any vehicle that rams into the Blind Drone is destroyed in the resulting explosion. Upgraded version: Homing Drone —hones in on vehicles (rather than simply following the ideal race line for the course). Flare - attracts any heat seeker missile that is close enough. 2: turn into a dumb missile and just go straight ahead. alt option: Missile locks onto another target in sight. The best game is when you can counter stuff other throw at you. Those weapons would be useless if you're not being targeted by a missile. Also, the shield serves the same purpose, but it does an even better job at protecting you. Combining smoke screen with mines is pretty cool, with racers just being able to vaguely see a mine through the thick smoke. It would be pretty balanced too, since whoever dropped the smoke is putting themselves in danger by allowing others to drop somewhat hidden mines. The drone is interesting because it launches behind you with momentum, but it would be hard to justify including it with the Quaker mine already implemented. I like the idea of some kind of counter against the missile other than a shield. You could save the flares for the last laps then. And this would become the optimal strategy very fast. Or maybe, you start with 0 flare, but everytime you end a turn being first, you gain 1 flare. Don't you think that'd put the focus on flares too much? GRIP: That game about flares. DEPLOYABLE WALL - A small (destructable) wall that is placed in the map untill an opponent drives over it. Imagine a small barrier that could be used in tricky corners, near shortcuts, or to create funnels toward other placed hazards in the map. This also creates some variety inside every lap, placing / being faced with these walls forces a quick problem-solving situation for the player (or a collision). These walls/barriers can also be countered by using another powerup that is able to destroy environmental objects (because it would destroy to wall). The collision with a wall would not dead-stop a player who drives into it but would substantially decrease his speed. This is a bit more of an instant rewards than (for example) an oil spill since, if there is no corner or forced steering, this becomes a lot less effective. Driving into a wall works no matter the conditions of the track at that position. Moo wrote: Most weapons said here have a lot of inspiration from RCSII, which is great. It had some really nice ideas. About the weapon charging... Wouldn't that make weapon upgrades pointless? What's the point of upgrading your weaponry in credits when you can have a powerful variant in like a lap or so? I would love to see more "baesty" weapons. At the time, being last or near it means you must pray for a ton of Boosts and missiles. I'd love to se power-ups that only appear if you are behind, and affect the WHOLE race. Like, when I read the Orbital Strike thing, I thought "Why stop there?". What about an orbital laser that goes through most part of the track, thick enough to hit 2 or 3 cars, but not so much so an skilled driver could dodge it. Maybe swarm missiles that target 3 or 4 cars at the same time. The Warp and Teleport thing from past Rollcage are also awesome. Something like an underground torpedo, like the normal missile, but going underground and hitting cars from the botton, making them fly. I mean, you get the idea. One of the problems I have right now is that if you make 2 perfect laps, not crashing and driving well, you end up with a lot of advantage. I'd love to feel a lot more pressure when I'm first, knowing there are a lot of things that can hit from behind and F me up. You know, just, balancing the race with more than just the catch up assist. Torpedo sounds kinda badass, but hard to counter, if possible at all. Zeres wrote: DEPLOYABLE WALL - A small (destructable) wall that is placed in the map untill an opponent drives over it. Some type of rare pickup that kicks the car high in the air, higher than typical rocket. Put player high in the air, but not make the car lose speed or fly out left or right, just make it "jump" straight. Playing rollcage redux everyday with guys at work and the game is as insanely fun as i remembered it to be. Please find a way to implement the time warp pick-up. So frustratingly brilliant!